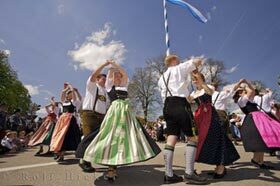 Here you find all Pictures from this special Bavarian German Culture day in Putzbrunn. Despite its close proximity to the bustling city of Munich, Putzbrunn, situated in the heart of Bavaria, is a village which possesses a rural quality and eagerness to celebrate its culture and traditions. May 1st is a day of Bavarian German culture and Putzbrunn together with many villages across Bavaria celebrate this day to the full. The Maibaum Festival is celebrated in early May of each year. Each community taking part in the celebrations, has a Maibaum otherwise known as a May Tree, which is painted prior to the event in the traditional Bavarian colours of blue and white. The painted Maibaum must be guarded at all times because of possible raids from neighbouring communities, who may have had their own Maibaum taken from them or been unable to secure one to paint. 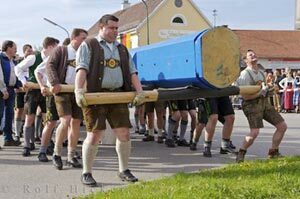 In the village of Putzbrunn, the celebration of culture begins with the completed Maibaum being wheeled into the public arena (town centre of Putzbrunn) by wagon, preceded by a brass band and escorted by traditionally dressed men and women. 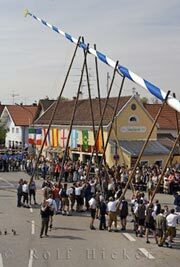 The short procession stops in the town centre where a team of no less than 30 men (dressed in traditional bavarian lederhosen) begin the, minimum 3 hour task of raising the 34 metre long Maibaum into position. The raising of the Maibaum in Putzbrunn does not involve using a crane or any mechanical device but rather the strength of a team of men, this is in keeping with Bavarian German Culture!! While the men are seeing to the raising of the Maibaum, the local's surround the tree and egg the men on with every heave - women dressed in traditional dirndl's and children also traditionally dressed, while enjoying Bavarian delicacies such as Weisswurst and Pretzels with Haendlmaier's mustard accompanied by Bavarian wheat beer. Once the Maibaum is finally in place, the decorations are added which includes small signs representative of the businesses in town such as butcher, bakery, dairy farmers etc., and a circular wreath near the base. Then the celebrations of Bavarian culture really begin with traditional dancing, music and a gun salute by the local hunting club. This is followed by a gathering in a large marquee with entertainment inside and out and plenty of good bavarian food and celebratory drinking. Special THANKS to the Burschenverein Putzbrunn and all the Putzbrunn People for having us at this special day. Putzbrunn is situated approximately 15 kilometres from Munich city centre and 60 kilometres from the Munich International Airport.